Morgan’s Jewelers has had the pleasure of serving the South Bay area of Los Angeles as an Official Rolex Jeweler for over 45 years. During this time we have seen the Rolex Watch Company cultivate success by manufacturing reliable, certified chronometer mechanical movements built within waterresistant cases suitable for any climate condition. The company’s heritage dates back to the early 1900s when Rolex introduced the Oyster, the world’s first water-resistant wristwatch, which was worn by Mercedes Gleitze during her successful swim across the English Channel in 1927. Since then, driven by a passion for innovation and a constant quest for excellence, Rolex has introduced improvements to the watches, both technological and aesthetic, making Rolex one of the most highly recommended and recognizable watches in the world. I have owned almost every one of these models myself over the past 40 years, and have worn them while skiing, scuba diving, motorcycle racing and swimming— even in hot Jacuzzis. The watches didn’t fail me once. This is why I think of my Rolex the same way I would think of a great friend, one who never lets you down, no matter the circumstances. 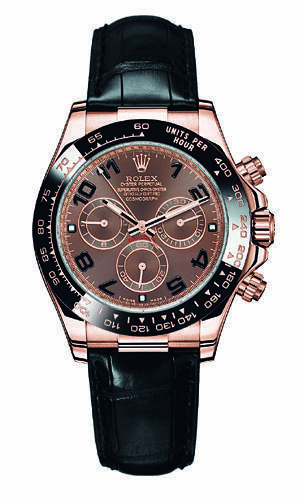 When considering a fine timepiece, you can rely on Rolex to offer the best value for your money. Here are some favorite models to consider. The Submariner diving watch, the chic model worn in James Bond movies, is celebrating almost 60 years as the ultimate diver’s watch. Designed for extreme underwater exploration, the Submariner Date and non-date have automatic movements and are water-resistant to 300 meters. The Submariner Date, measuring 40mm, is available in various metals. 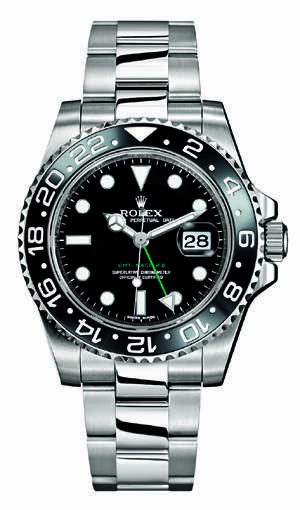 The Rolex Deepsea model measures 44mm, and is water tested to an impressive 3,900 meters. With its new 44mm case size, this timepiece was created for the yachting enthusiast, professional sailor, or anyone that enjoys an outstanding watch with a complicated bezel action. 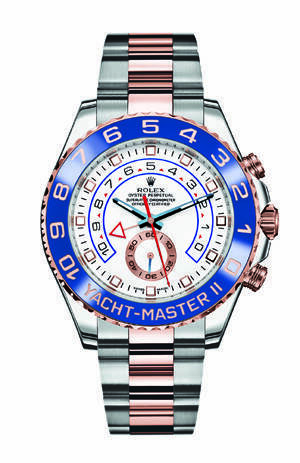 The Yacht-Master was the first timepiece to be built with a programmable countdown and mechanical memory, giving it the ability to be synced with the start time of a race. Complex in design, simple in use, Yacht-Master II is available in a variety of metals including stainless steel with pink gold. This watch is known as the “Pilot’s Watch,” with a specified design that was developed for international flying. The most important features are its second time zone capability, or GMT hand, and corresponding rotating bezel. This model offers a date calendar, automatic movement and is available in various metal combinations. 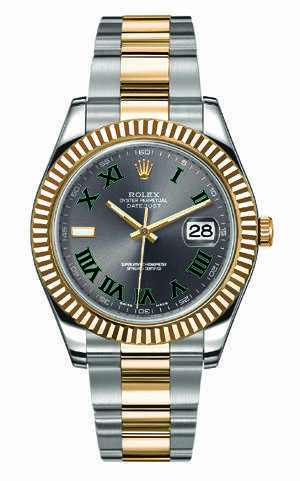 The Rolex Datejust model was the first timepiece to display the date through an aperture on the dial, and the iconic magnifying Cyclops eye over the date was added a few years later. The Datejust II features a 41mm case size and has proved to be widely popular amongst those favoring the model but desiring a larger timepiece. For those happy with the original 36mm Datejust, it is still available, and the line features upgraded dials and bezel treatments. According to the legend, United States President Lyndon B. Johnson donned his yellow gold Day-Date regularly, and from that the term “President” watch was born. The 41mm Day-Date II is the newest model available in the line of Day-Dates. Both the original 36mm Day-Date and the Day-Date II are available in a yellow, white or pink gold, as well as platinum, with a variety of diamond options. Last but not least, I must mention the beautiful lineup of women’s watches, from stainless steel and diamonds to all gold or platinum with colored stones, each created with the signature Rolex elegance. These pieces are the best value and style for the woman on the go or in the boardroom. Like every great machine, your Rolex requires proper maintenance. Having a full factory service, which is recommended every five years, will restore your timepiece to an almost new condition. This maintenance not only keeps your watch looking and running well, but it helps ensure the watch will last a lifetime.